Happy Hamby Campers: There be treasure! The timing of our Bendigo visit was due to the Bendigo Gem Club's weekend exhibition. Nick was given a free ticket - and though adult admission was already cheap (only $5 each), we were appreciative of the extra discount! Children received free entry, as well as some time in the junior fossicking area. While there, Vaughan collected 48 polished stones of varying sizes and was well-pleased with his treasure! His favourite is a piece of tigereye, which he intends to make into a pendant. One of the stall holders gave Vaughan a length of leather thonging to use for hanging the stone. Vaughan is under instruction to wear the finished piece to the next show, proving that he did carry out his promise of drilling the stone (under supervision and using a mask, due to the asbestos content). Discounted entry aside the exhibition provided wonderful (cheap) entertainment. We paid $10 for entry, bought a $1 (non-winning) raffle ticket and spent $5 on rocks! The four of us were happily engrossed for more than two hours - great value for our $16! Vaughan and I stayed at one stand, admiring how black obsidian is translucent when held over a torch. Fascinating stuff! He carefully selected one $3 piece to bring home but we were given an bonus stone when I told the man how much fun we'd had looking! The Mineral Society of Victoria had a display where we could view small mineral samples (housed in open cases, smaller than a matchbox) under microscope. Wow! I dragged Nick over to show him and he said that our local lapidary club had plans of buying a microscope (with camera function). I'm looking forward to that! There were many displays. Another favourite was watching enamel beads being made. Vaughan was referred to as a hard task-master (!) but was asked to select coloured beads for several creations. He was later given one of the beads that had been crafted under his supervision! We've been to a few gem shows over the years. This was our first Victorian event but all have been great-value fun for all the family. If you spot one in your local area, it would be well worth a visit! 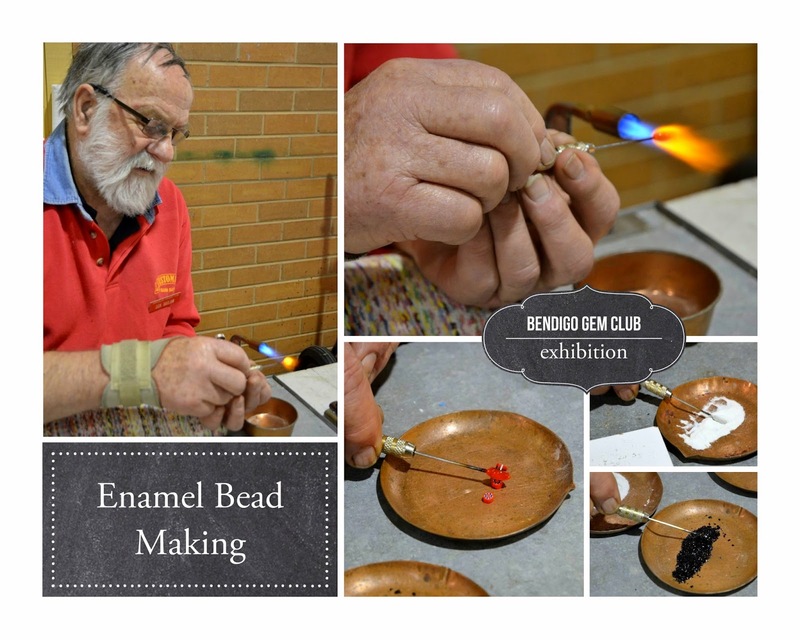 The Victorian Gem Clubs Association has a list of upcoming events, as does the NSW Gem & Lapidary Council. I expect the other states have similar associations.